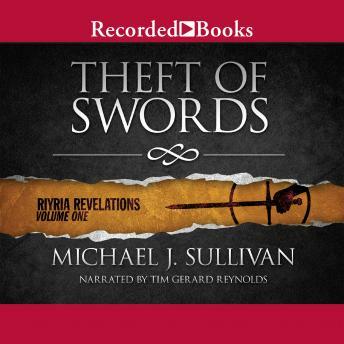 Acclaimed author Michael J. Sullivan created instant best-sellers with his spellbinding Riyria Revelations series. This first volume introduces Royce Melborn and Hadrian Blackwater, two enterprising thieves who end up running for their lives when they're framed for the death of the king. Trapped in a conspiracy bigger than they can imagine, their only hope is unraveling an ancient mystery-before it's too late. This epic fantasy includes a little breaking and entering, plenty of snarky insults, political intrigue, magical beasts, and a chaotic neutral maimed mage. For me, the tale started off fun but not particularly special. It wasn’t until about a quarter of the way through the book that the tale grabbed me. Royce and Hadrian are a lot of fun. They’ve known each other for years and each is well into their adult years. This was a nice break from all those epic fantasy adventures that feature teen/young adults bumbling through their first adventures. Royce was my favorite because we have the same dark sense of humor and have to sometimes be talked into doing the right thing. Hadrian is an enthusiastic believer in honor and all things good. It’s a very good thing these two have each other to balance things out. Each has a history veiled in questions and half truths. I look forward to Book 2 revealing more on this note. The one weakness to this tale is the ladies. It’s not all bad, but for the most part they are comforters and romantic interests and need to be rescued. Arista shows promise with her wit and ability to grasp politics. Also young Thrace has a shining moment at the end of the novel. The ladies aren’t the worst I’ve seen in epic fantasy but I did want just a bit more from them. There’s a big fat mystery with the elves. Ancient conflict and truces are eluded to and I expect that will become a big deal later in this series. There are a few elvish slaves in some areas of the human realms, but no elves roam free… or if they do, they can pass for human. The maimed mage Esra provides most of what we know about the elves. He’s ancient and was imprisoned for perhaps 900 years (if I recall correctly). Esra is a big enigma. I don’t know what he wants and he might not know either. He has to keep his head down as he’s still a wanted criminal. Then there’s Myron. I adored this character because of his wide eyed wonder of the bigger world. He grew up in a monastery and had never been off the grounds. He had seen a few horse but never rode one and he’s never seen a woman. As he gets swept up into the adventure, he provides several chuckles. I too wish there were blue horses. By the end, I had fallen in love with the main characters. I really look forward to adventuring further with Royce and Hadrian. 4/5 stars. The Narration: Tim Gerard Reynolds gave a great performance for this book. He had distinct voices for all the characters and his female voices were believable. He sounded like he had a lot of fun narrating this story too. I did notice a few short repeats but there were no other technical issues with the recording. I loved his voice for Myron (always full of wonder), his skeptical voice for Royce, and his honorable voice for Hadrian. 4.75/5 stars. I absolutely loved it . The first book introduce the characteristics the second book the story gets deeper. It has a lot of twists, a lot of surprises, I enjoyed reading every bit of it. I’ve completed all the six books I wish they bring the story into a TV show sometime in my lifetime.